Mark enlisted the help of his young daughter and our designers to create the perfect engagement ring for Kate. 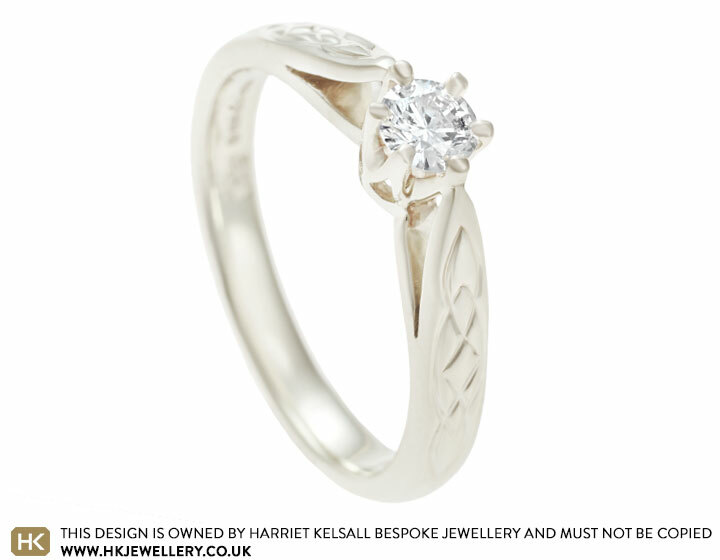 Mark loved the idea of Celtic knot detailing to symbolize their everlasting unity. At the centre of the 9 carat white gold engagement ring is a 0.22ct brilliant cut H Si2 diamond which is held in a six claw setting. The Celtic design needed to be subtle enough for Kate to wear the ring everyday so each shoulder has been engraved with Celtic knots. The tapering band and side splits also ensures the ring remains light and feminine.